You’d think there was some kind of misinformation campaign going on about the Ushahidi-Haiti Crisis Map given the number of new lies that are still being manu-factured even though it has been over three years since the earthquake. Please, if you really want a professional, independent and rigorous account of the project, read this evaluation. The findings are mixed but the report remains the only comprehensive, professional and independent evaluation of the Ushahidi-Haiti and 4636 efforts. So if you have questions about the project, please read the report and/or contact the evaluators directly. In the meantime, I’ve decided to collect the most ridiculous lies & rumors and post my all-time favorites below. Robert, the person responsible for Mission 4636, agreed (in writing) to publish the SMS’s after two lawyers noted that there was implied consent to make these messages public. The screenshot of the email below clearly proves this. Further-more, he and I co-authored this peer-reviewed study several months after the earthquake to document the lessons learned from the SMS response in Haiti. Surely if one of us had heard about these concerns from the Diaspora, we would have known this and reconsidered the publishing of the SMS’s. We would also have written this up as a major issue in our study. Moreover, the independent and professional evaluators referred to above would also have documented this major issue if it were true. I, for one, did not receive a single email from anyone involved in Mission 4636 demanding that the SMS’s not be made public. None of the Boston-based Haitian volunteers who I met in person ever asked for the messages to remain con-fidential; nor did Haitian Diaspora journalists who interviewed us or the many Haitians who called into the radio interviews we participated in ask for the messages to remain secret. Also, the joint decision to (only) map the most urgent and actionable life-and-death messages was supported by a number of humani-tarian colleagues who agreed that the risks of making this information public were minimal vis-à-vis the Do No Harm principle. On a practical note, time was a luxury we did not have; an entire week had already passed since the earthquake and we were already at the tail end of the search and rescue phase. This meant that literally every hour counted for potential survivors still trapped under the rubble. There was no time to second-guess the lawyers or to organize workshops on the question. Making the most urgent and actionable life-and-death text messages public meant that the Haitian Diaspora, which was incredibly active in the response, could use that information to help coordinate efforts. 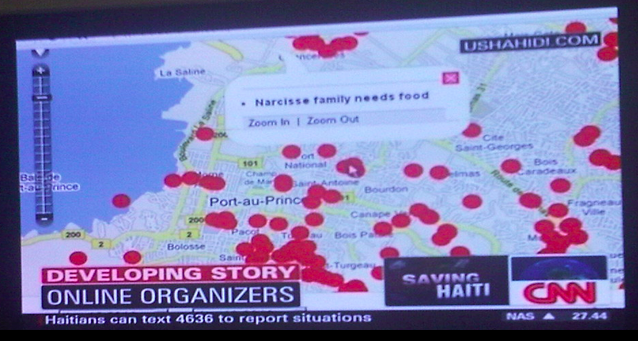 NGOs in Haiti could also make use of this information—not to mention the US Marine Corps, which claimed to have saved hundreds of lives thanks to the Ushahidi-Haiti Crisis Map. Crisis Mapping can be risky business, there’s no doubt about that. Sometimes tough-but-calculated decisions are needed. If one of the two lawyers had opined that the messages should not be made public, then the SMS’s would not have been published, end of story. In any case, the difficulties we faced during this crisis mapping response to Haiti is precisely why I’ve been working hard with GSMA’s Disaster Response Program to create this SMS Code of Conduct. I have also been collaborating directly with the International Committee of the Red Cross (ICRC) to update Data Privacy and Protection Protocols so they include guidelines on social media use and crisis mapping. This new report will be officially launched in Geneva this April followed by a similar event in DC. 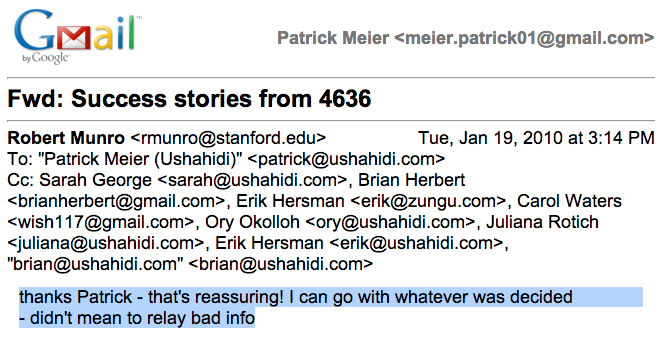 Then why was Josh Nesbit looking for an SMS solution specifically for Ushahidi? The entire impetus for 4636 was the Haiti Crisis Map. Thanks to his tweet, Josh was put in touch with a contact at Digicel Haiti in Port-au-Prince. Several days later, the 4636 short code was set up and integrated with the Ushahidi platform. Dd’s co-founder Emily Jacobi is a close friend and trusted colleague. So I emailed her about this fun new rumor back in October to see if I had somehow missed something. Emily replied: “It’s totally ludicrous to claim that Dd solely set up any of those processes. I do think we played an important role in helping to inform, document & systematize those workflows, which is a world away from claiming sole or even lead ownership of any of it.” Indeed, the workflows kept changing on a daily basis and hundreds of volunteers were trained in person or online–often several times a day. That said, Dd absolutely took the lead in crafting the work-flows & training the bulk of volunteers who spearheaded the Chile Crisis Map. I recommend reading up on Dd’s awesome projects in Haiti and worldwide here. Again, I was stunned, but in a good way. Kate Chapman, the director of Humani-tarian OpenStreetMap, is a good friend and trusted colleague, so I emailed her the following: “I still hear all kinds of rumors about Haiti but this is the *first* time I’ve come across this one and if this is indeed true then goodness gracious I really need to know so I can give credit where credit is due!” Her reply? She too had never heard this claim before. I trust her 100% so if she ever does tell me that this new rumor is true, I’ll be the first to blog and tweet about it. I’m a huge fan of Humanitarian OpenStreetMap, they really do remarkable work, which is why I included 3 of their projects as case studies in a book chapter I just sub-mitted for publication. In any event, I fully share Kate’s feelings on the rumors: “My feelings on anything that had to do with Haiti is it doesn’t really matter anymore. It has been 2 and a half years. Let’s look on to preparedness and how to improve.” Wise words from a wise woman. This is probably one of the strangest lies yet. Everyone in Boston knows full well that Sabina was not directly focused on translation but rather on outreach and partnership building with the Haitian Diaspora. Sabina, who is a treasured friend, emailed me (out of the blue) when she heard about some of the poisonous rumors circulating. “This was a shock to me,” she wrote, “I would never say anything to put you down, Patrick, and I’m upset that my words were mis-interpreted and used to do just that.” She then detailed exactly how the lie was propagated and by whom (she has the entire transcript). The fact is this: none of us in Boston ever sought to portray the Diaspora as insignificant or to downplay their invaluable support. Why in the world would we ever do that? Robert and I detailed the invaluable role played by the Diaspora in our peer-reviewed study, for example. Moreover, I invited Sabina to join our Ushahidi-Haiti team precisely because the Diaspora were already responding in amazing ways and I knew they’d stay the course after the end of the emergency phase—we wanted to transfer full ownership of the Haiti Crisis Map to Haitian hands. In sum, it was crystal clear to every single one of us that Sabina was the perfect person to take on this very important responsibility. She represented the voice and interests of Haitians with incredible agility, determination and intell-igence throughout our many months of work together, both in Boston and Haiti. 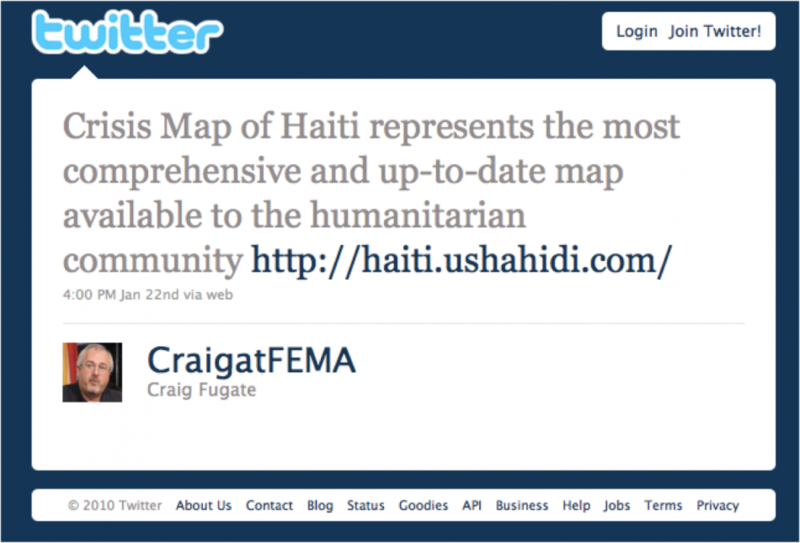 This entry was posted in Crisis Mapping and tagged 4636, Haiti, lies, misinformation, rumors. Bookmark the permalink. What I would like to know is how a non-scientific, non-technical article on Mission 4636 ends up in the Journal of Information Retrieval and Knowledge Management…it seems to deviate from the type of article published in the previous two volumes, which considering that the journal is only published once a year, tells us that it hasn’t been around all that long. Maybe they have a shortage of submissions for the 2013 volume and need to fill space. On the positive side, Patrick, he is giving you free publicity….not many have the honor of being singled out by first and last name in a journal article…. though he could have shown you the courtesy/respect of calling you Dr. Patrick Meier. Hey hey. It’s always exciting to receive a google alert for your own name (that’s right I’m honest enough to admit my vanity)! 1. I thought the sms were going back to the ground already before the map was setup, ie the first thing that got done was to create a process for info to flow from individuals on the ground to responders on the ground. 2. I do remember concerns in the Skype chat about making the data public. But like I said it was three years ago and I was pulling all nighters. Thanks for writing in, Tim! Yeah, we were all sleep (and food deprived) during the first weeks following the earthquake. It was definitely an intense period. I don’t recall if the professional evaluators of Ushahidi-Haiti / 4636 captured that link with Reuters or whether it had any impact, re your first point. On point 2, I don’t recall that Skype chat either; there were hundreds and hundreds of pages worth of Skype chats produced around the clock during that first week, not to mention hundreds of emails and phone calls. But again, we did reach out to two lawyers who opined there was implied consent. And Rob who spearheaded 4636 also agreed to publish the SMS’s. In any case, as Kate writes, “My feelings on anything that had to do with Haiti is it doesn’t really matter anymore. It has been 2 and a half years. Let’s look on to preparedness and how to improve.” Hence the launch of the Digital Humanitarian Network, the work with GSMA on a Code of Conduct and with ICRC on data protection protocols for a digital world. Thanks again for all the countless hours and sleepless nights you contributed to these efforts in Haiti, Tim.